According to our Literature specialist John D. Larson, there are five first editions of Fahrenheit 451 of interest to collectors. As with all important modern first editions, a set of criteria should be met. 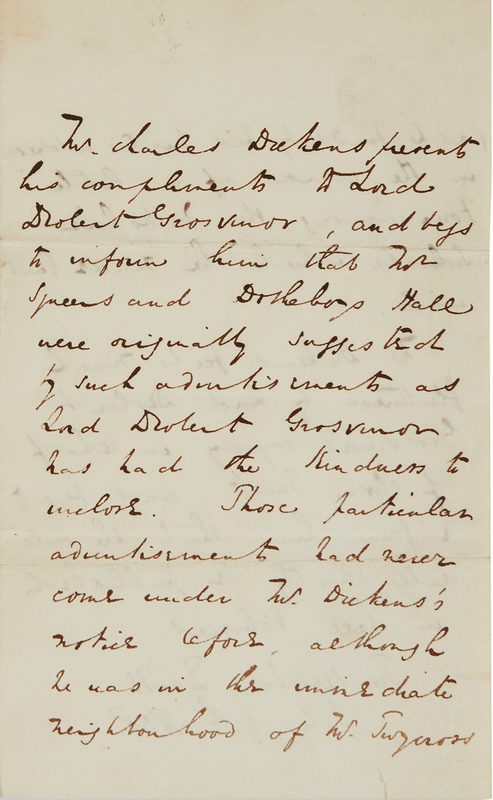 A fine copy should not previously have belonged to a library, nor should it bear stains, tears or chips to the jacket that affect letters and anything else that differs from the way the book appeared on the day it first arrived in the store. 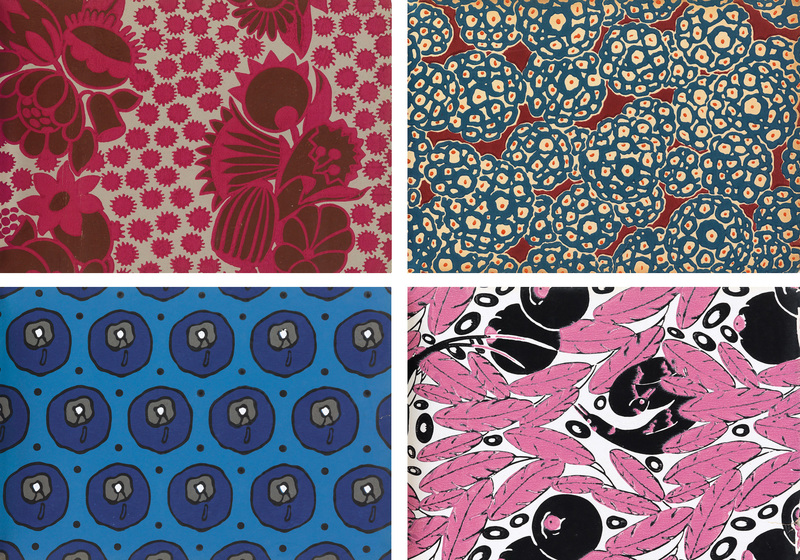 The value of a given copy is established via comparable copies previously seen at auction. Condition of binding, contents, and, of course, the dust jacket are critical determinants. Signed or inscribed copies bring a premium. It should be noted, however, that signed copies of first editions by Ray Bradbury are not scarce; he was a rather public figure, but early signatures are still especially appealing. 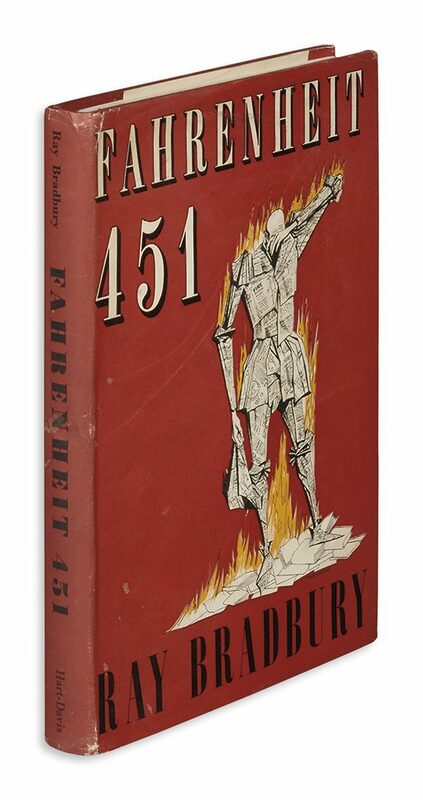 So, here are things to look for in the top five most desirable editions of Fahrenheit 451. 5. The first edition in England was published in 1954, one year after its release in the United States. Its red dust jacket is important to its value. Ray Bradbury, Fahrenheit 451, first English edition, London, 1954. Sold November 14, 2017 for $423. 4. While not technically a first edition, the book released by the fine publishing company Limited Editions Club in 1982 is highly collectible. 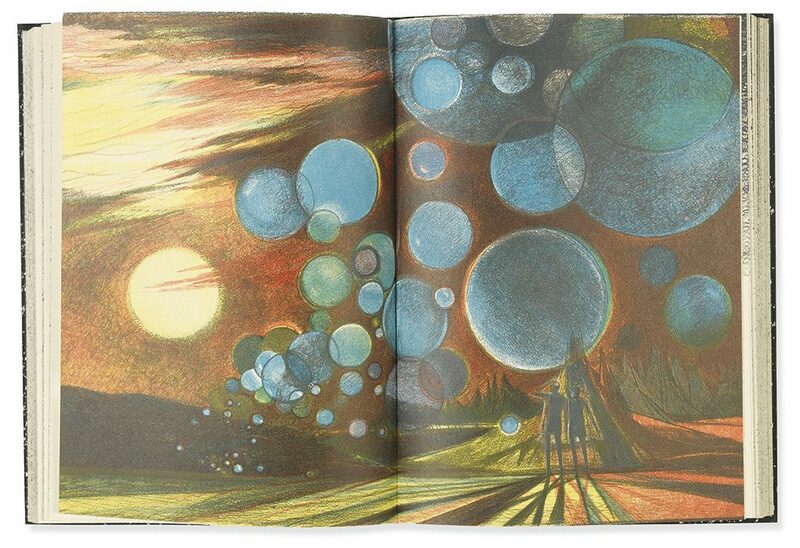 The edition consists of 2,000 copies, featuring one color lithograph and illustrations by Joe Mugnaini. It was issued without a dust jacket. The best copies of this edition are signed by both Bradbury and Mugnaini. Ray Bradbury, Fahrenheit 451, Limited Editions Club, signed, New York, 1982. Sold June 10, 2015 for $423. 3. The first trade edition, published by Ballantine Books in 1953, should retain a fine dust jacket. The colors of the spine of the jacket should not be too faded, though even virtually pristine copies almost always have some sort of fading. Another prize would be a copy signed in the year of publication. Perhaps there exists a copy inscribed by Bradbury to Francois Truffaut, who directed the film version of the book; that would be newsworthy and command a very high premium. 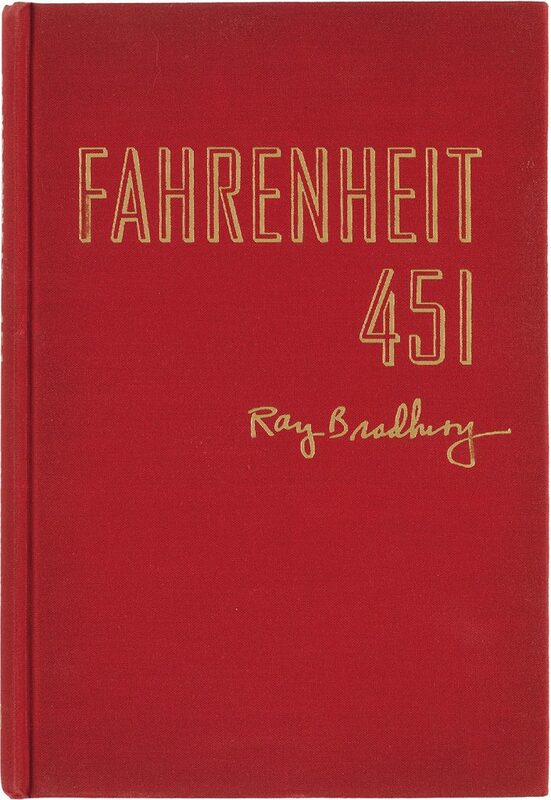 Ray Bradbury, Fahrenheit 451, first edition, signed, New York, 1953. Sold November 14, 2017, for $5,200. 2. The limited first edition bound in asbestos is especially appealing to collectors because it is charmingly self-referential. The novel imagines a world in which reading is outlawed, and fire men are instructed to burn any books they find, as well as the houses where the books were kept. The title, Fahrenheit 451, refers to the temperature at which paper burns. Because it is bound in asbestos, this edition would not burn in the case of such a dystopia. This numbered edition of 200 was published without a dust jacket, leaving the binding exposed. This, in conjunction with the absorbent nature of asbestos, makes for a typically scruffy exterior. The whiter and crisper the cover, the more valuable your book could be. 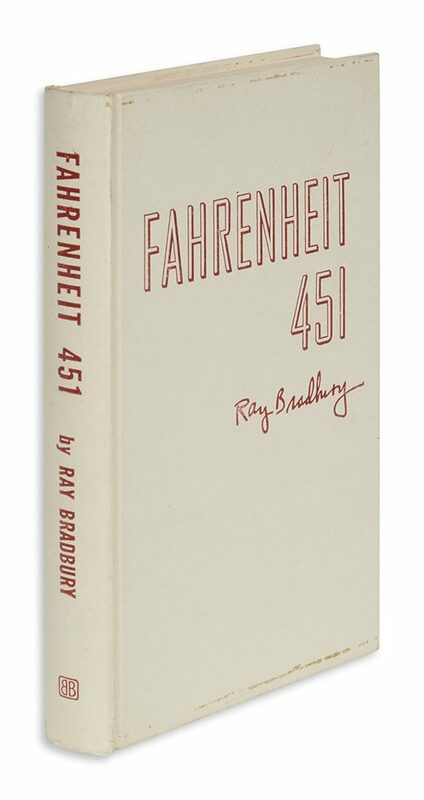 Ray Bradbury, Fahrenheit 451, first limited edition, bound in asbestos, signed, New York, 1953. Sold November 14, 2017, for $8,750. 1. The specially bound author’s edition consisted of 50 unnumbered copies was bound up specially for Bradbury. The tome is distinguished from the trade edition by the slightly different binding: under the slipcover, the special edition boasts gilt lettering embossed on red cloth. The trade edition’s cover is lettered in yellow. John notes that this is a “subtle distinction but a crucial issue point.” The copy in our May 15 auction comes from the estate of Stanley Simon, a private collector in Queens, and was inscribed to him by Bradbury in 1982. 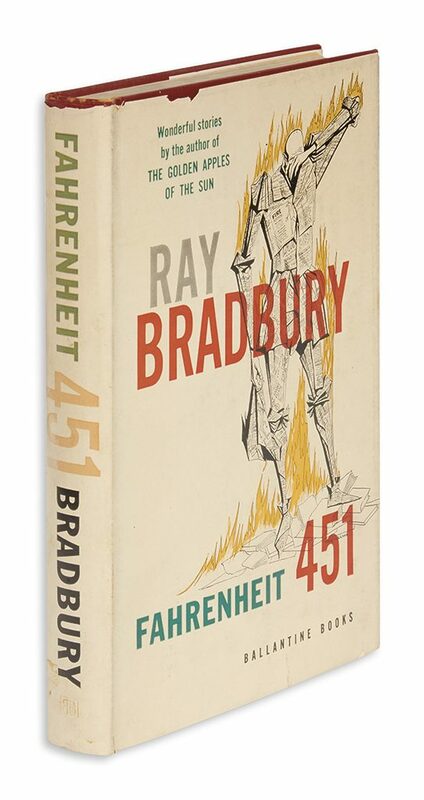 Ray Bradbury, Fahrenheit 451, limited author’s edition, presentation copy, signed, New York, 1953. At auction May 15, 2018. The next auction of 19th & 20th Century Literature at Swann Galleries will be held on May 15, 2018.